This office complex was on the site of a proposed office building. 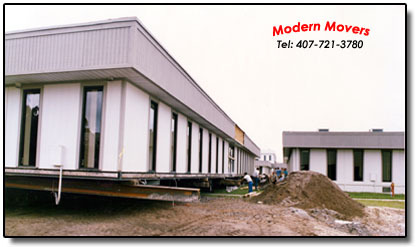 The structure, measuring overall 108’ wide and 120’ long at 250 tons, was relocated to the adjacent lot to make way for the new building for Lockheed-Martin Defense plant in Orlando, June, 1986. Security, power, and utilities were maintained throughout the relocation. Due to security at this facility, this is the only photograph that was allowed.